Hellloooo, faithful readers! 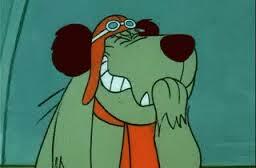 It is moi, your long-lost, four-legged blogger back from the ether. I am re-emerging from my 16 month, 22 day writing break because, well, I miss you all and I think it is time for my voice to rise again. There is so much to catch you up on. Disgusting monster also known as a flea. Before I knew it, Dad was carrying me with outstretched arms (could he have looked any more disgusted? Where’s the love?) to the bathtub. My parents had totally tag-teamed me. Mom was already in the bathroom and the water was running. I tried as hard as I could to give her a sad face and subliminally will her to give me the shortest bath possible, but, alas, it was futile. That was the longest bath of my life. She really wanted me clean, I guess. That night, we all went to bed, thinking we’d killed those buggers. But, no. 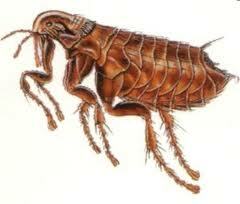 Fleas apparently don’t take near-extermination lying down. They just multiply. My parents were not happy about this and the next morning Mom loaded me into the backseat of the car to go to the Presidio. Sweet, a nature walk on a work day! Yeah…no. This was no walk in the park. This was a mission to pillage poor Eucalyptus trees for their leaves (a vet told us that if you put those leaves all over your house, it will scare away the fleas). Mom was concerned that she would get caught by angry nature-lovers, so we had to be stealth about it. 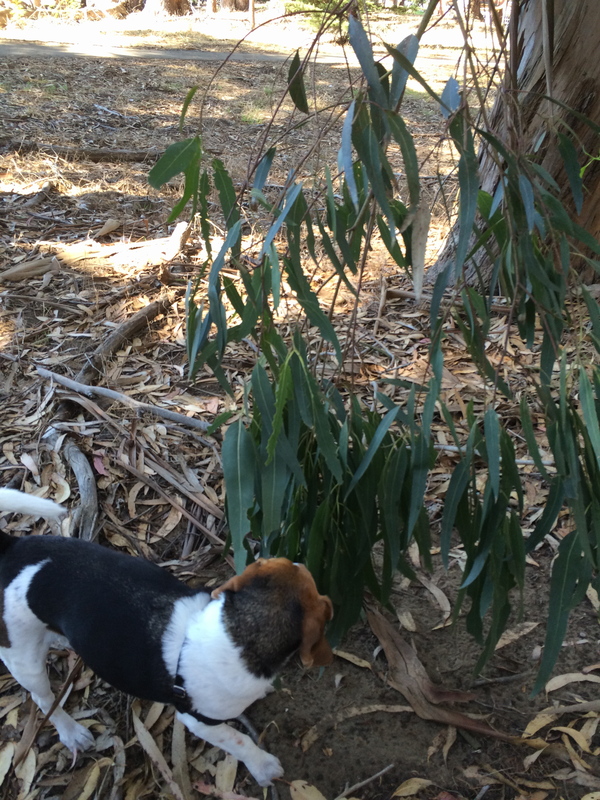 Doing a little eucalyptus recon. Every time someone walked by, I would go over to Mom and wag my tail. We are just walking through the park, right? We fooled all of them. 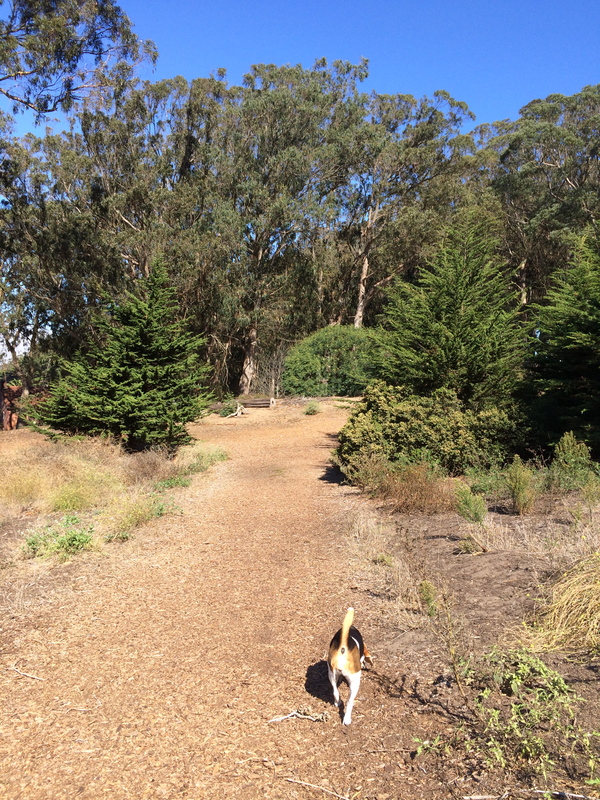 I went up ahead of her to sniff out the best tree possible and it wasn’t long before I found the perfect candidate. Look at my find! I should get paid for my talents. Mom quickly tore about 50 leaves off the tree, stuffed them into a bag and then we hit the road. On our way home, we stopped by Animal Connection II on Washington Street, my favorite store BY FAR (they have buckets of treats on the floor to encourage gorging. What could be better than that?) 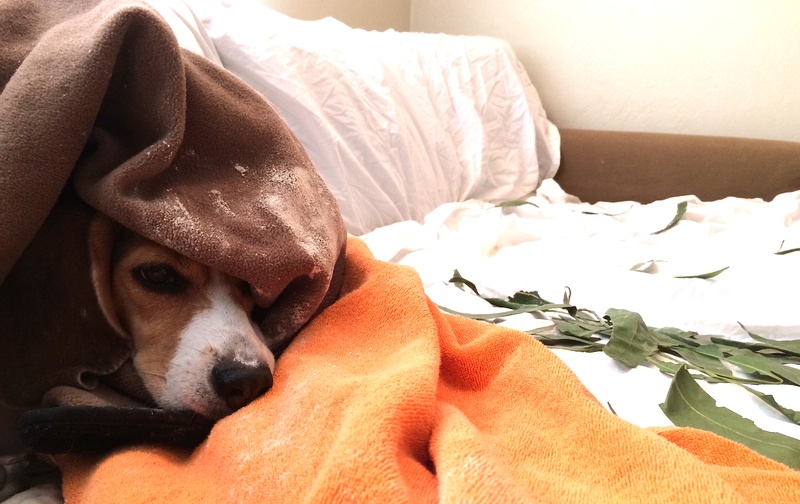 to pick up this white powder that I guess was to scare away the fleas, too. Whatever, I was too busy inhaling bones to really pay attention. I was bummed to leave what I wish was my second home, but Mom seemed a little testy that day, so I followed her back to the car. When we got home, I realized for the first time that she must love nature as much as I do. She also must love making a mess as much as I do, because that is exactly what she did. 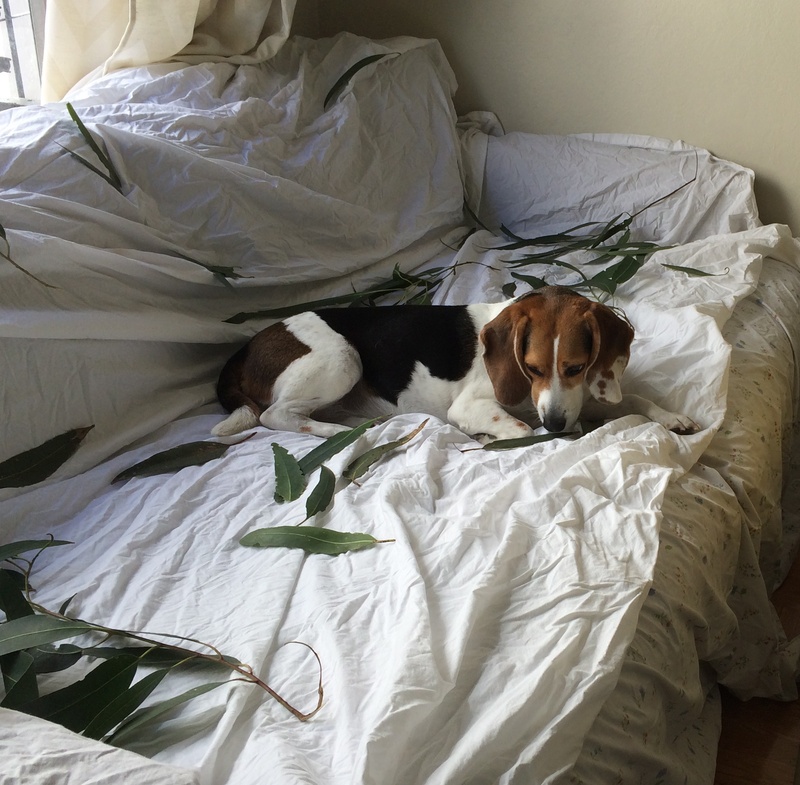 Over the course of the next hour, she covered the couch with a white sheet, threw the white powder she’d bought over every surface (I really mean every surface – tables, chairs, blankets, she even tried to grind it into the carpet) and then laid the 50 eucalyptus leaves all over everything. From there, she filled half a dozen bowls with warm soapy water and put them all over the house. For the next several days, whenever Mom or Dad would find a flea on me, they would pinch it in their fingers and then dunk it in the bowls of water lying around since fleas only die if they are drown in water. If you just squeeze them and throw them away, eggs can come out – gross! So, here I am, in my new home that is now a jungle. Since I am a lady with proper manners and don’t like specks of dust on me (in my home, that is), let alone leaves, this new life at home was quite an adjustment for me. Messy, yes, but at least those leaves made our house smell like a spa. It was also an adjustment for Dad, but I think more than anything he thought the whole situation was hilarious. That is, until he found another flea. Then, he started sprinkling that white stuff, just like Mom. Sometimes I think I’m living with a couple whack jobs. Just sayin’. Trying to escape the powder and leaves. This is on day three of flea-gate. After six or so days, my parents stopped taking their crazy pills and life returned to normal. We decided to celebrate by going to a new beach, just south of Pacifica. But then….the biggest drama of my life happened. You’ll have to read my next blog post to learn more. I’m so good at building suspense!